Following the Biscuit Fire of 2002, which burned half a million acres in the Siskiyou National Forest in southwest Oregon, the Bush administration geared up to circumvent national environmental laws and implement the largest public timber sale in recent history, all in the guise of “salvage logging” purportedly aimed at helping the forest regenerate. The Siskiyou region is one of the few areas in the lower 48 states that still contains extensive roadless wild forests and healthy salmon runs, and it is the most biologically diverse ecosystem on the West Coast. Environmentalists were naturally alarmed by this grab for timber, since they were well aware that burned forests are biologically rich and that dead trees provide habitat for a myriad of species as well as enriching the soil as they decompose. Furthermore, not widely known by the general public, in order to boost the value of the sales, a large portion of the timber taken in “salvage” sales comes from the cutting of live (often centuries-old) trees that survived the flames. Long-time environmental activists knew from experience that logging and the road-building that typically accompanies it damage soils, increase erosion, and undermine the integrity of forest ecosystems. 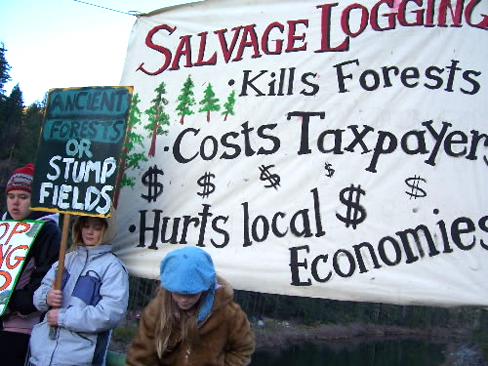 Disregarding the threats to the forest ecosystem, the U.S. Forest Service, backed by several prominent forestry professors from the College of Forestry at Oregon State University (OSU), supported logging in the burned area and, after extensive legal wrangling, managed to push through several timber sales despite widespread public opposition. Advocates of the sales argued that logging was necessary to help reduce the risk of future fires and speed forest recovery. In an attempt to cut through the often emotionally charged debate over the effects of salvage logging on forest regeneration, Daniel Donato, a graduate student in the Department of Forest Science at OSU, and his five colleagues undertook a study examining sites burned in the Biscuit Fire before and after salvage logging operations to scientifically assess the effects of logging on the land. The results of this study, informatively titled “Post-Wildfire Logging Hinders Regeneration and Increases Fire Risk,” were published by the prestigious journal Science, initially on-line on January 5th of this year, followed in the print edition on January 20th.1 Donato and his colleagues concluded that their “data show that postfire logging, by removing naturally seeded conifers and increasing surface fuel loads, can be counter-productive to goals of forest regeneration and fuel reduction.” These results, obviously, undermine the arguments made to justify the salvage logging and are particularly pertinent since Congress is considering developing legislation that would mandate logging on public lands after fires and bypass input from the public. The scandal surrounding the shaky rationale used to support the logging in the first place may be surpassed by the one emerging after recent events. Press reports reveal that several forestry professors at OSU as well as officials at the U.S. Forest Service tried to suppress the study. In an unorthodox move, they appealed to the editor of Science, Donald Kennedy, a former President of Stanford University, to not publish the study unless it was modified to address their concerns. Kennedy, noting that the effort to stop publication raised concerns about censorship, rightly argued that debate on the issue should take place in an open scientific forum and published the study. The paper by Donato and his colleagues, like all papers submitted to Science, was subjected to rigorous external review by experts on the subject before being accepted for publication. Serious ethical concerns are raised by the attempt of the OSU professors who did not like the findings of the study to disrupt the typical publication process and undermine a graduate student in their own college. One important issue at the heart of this controversy is the potentially malign effect of corporate interests on academic freedom and the scientific process. The OSU College of Forestry and many of its faculty members have long had close ties to the timber industry and a portion of the funding for the College comes from a tax on logging. Download the chart as an Excel file. The incident at OSU and others like it raise serious concerns about the influence of private capital on the scientific research and publication process and on freedom of speech more generally. There are an alarming number of cases where scientists who are supposed to be impartial judges of scientific evidence have close ties to capital interests which favor certain types of research findings. Although it is heartening that there are more than a few scientists, like Donato and Chapela, who are willing to go against powerful interests, attempts to suppress research findings that conflict with corporate agendas ought to spur the public to question how power is distributed in our world. 1 D. C. Donato, J. B. Fontaine, J. L. Campbell, W. D. Robinson, J. B. Kauffman, and B. E. Law, 2005, “Post-Wildfire Logging Hinders Regeneration and Increases Fire Risk,” Science 311.5759: 352. 2 Rex Dalton, 2004, “Review of Tenure Refusal Uncovers Conflicts of Interest,” Nature 430.7000: 598. 3 Rex Dalton, 2004, “Biotech Funding Deal Judged to Be ‘A Mistake’ for Berkeley,” Nature 430.7000: 598. Richard York is an assistant professor of sociology at the University of Oregon and is on the Board of Directors of the Siskiyou Project (http://www.siskiyou.org/), a non-profit organization working to protect the Siskiyou ecosystem, which opposed the Biscuit timber sales.